Defending the west of the county. Welcome to the EDGE Guide to Egremont Castle. The castle was begun in the early C12 by William le Meschin. It changed hands no less than six times in the next two hundred years. Ownership history being: Robert de Romilli of Skipton upon the death of le Meschin in 1134; then William Fitz Duncan, a relative of King David I of Scotland; on his death in 1151 it passed to Reginald de Lucy; 1215 saw it in the ownership of Lambert de Multon; In 1335 it passed to Robert Fitz Walter of Essex. The castle resisted fierce attacks by the Scots in 1138 and then again in 1315 and 1322. In 1371 Walter Fitz Walter was held prisoner by the French in Gascony, and ransomed by mortgaging the Castle for the then truly huge sum of £1000. In 1444 Robert Radcliff became the owner by marriage, followed by his son who on becoming the Earl of Sussex sold the castle to Henry Percy, the 15th Earl of Northumberland in 1529. Henry kept the castle for only six years before giving it to the Crown. The building fell into disrepair and was restored to Thomas Percy, 16th Earl of Northumberland. 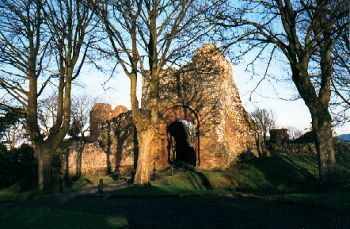 Thomas was executed in 1572 and the castle fell further towards ruination. The 11th Duke of Somerset, Charles Seymour, was the next owner in 1682. In 1750 the castle passed to the Lords Egremont and they have remained in possession ever since.